The saying “You can’t judge a book by its cover” can sometimes be applied to primate mating system and social system. Primate social systems sometimes differ from mating systems, as evidenced by reports of field observation (although sometimes first-hand field observations mistakenly report and link primate social systems to mating systems). For example, geladas (Theropithecus gelada) can be observed forming multimale-multifemale social groups (herd) as they graze nonchalantly up in the highlands of Ethiopia but when it comes to mating system, geladas mate in a OMU (one-male unit) where one male mates with multiple females of the unit (Gron, 2008). Primate mating systems can be approached in two different point of views: male coercion or female choice. The latter has been the focus of most primatologists in recent years. The Mating System of the Sichuan Snub-Nosed Monkey (Rhinopithecus roxellana), by Guo et al. (2010) on the current issue (Vol 72:1) of American Journal of Primatology is a paper that examines female choice (female mating strategy) in the mating system of Sichuan snub-nosed monkey (specifically the Qinling subspecies) population in the Qinling Mountains, China. I have the pdf. for the paper if anyone wants to read it. 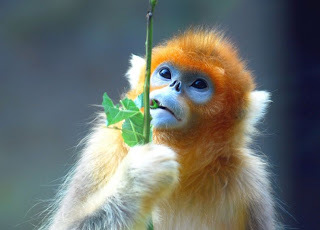 A Golden snub-nosed monkey feeding on leaves. Photo from Arts on Earth. R. roxellana basic unit consist of a OMU, which consist of one male and about eight females. They are arboreal herbivores; living in temperate, mountainous forests in China (Gron, 2007). Males and females exhibit sexual dimorphism, where males are heavier and bigger than females (Gron, 2007). 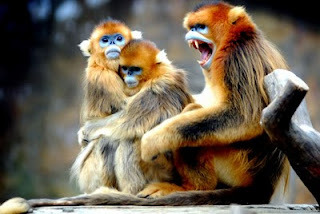 Qinling Golden snub-nosed monkeys (Rhinopithecus roxellana qinlingensis) are considered a subspecies of Sichuan snub-nosed monkeys or Golden snub-nosed monkeys (Rhinopithecus roxellana) by Wilson and Reeder’s Mammal Species of the World. R. r. qinlingensis can be differentiated from the other subspecies by its brilliant golden pelage. The Golden snub-nosed monkey lives in temperate, mountainous forest of China. Photo from the Smithsonian. Golden snub-nosed monkeys grooming. Photo from Wikipedia. 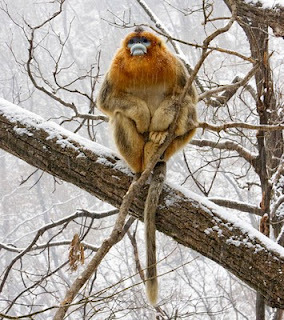 Thought to be of polygynous mating system (one male-multifemale), most of the Sichuan snub-nosed monkeys from Qinling Mountains population were observed in a polygamous mating system (multimale-multifemale) instead. About 18% of the females from this population were observed copulating with males outside of the unit (extra-unit males), in which the researchers call the “extra-unit mating behavior”. This behavior was observed from field site by the researchers. Paternal DNA done on the population shows that more than 50% of the offspring were sired by extra-unit males. 94.5% of copulation with extra unit males were initiated by females. Golden snub-nosed monkeys. Photo from Arts on Earth. Three theories were proposed to explain the evolutionary purpose of extra-unit mating behavior: infanticide avoidance, inbreeding avoidance and gaining access to resources. However, Guo et al. (2010) posit that mating with extra-unit males in R. roxellana qinlingensis is adaptive and were probably due to infanticide avoidance. In five years of continuous study, there were no observation of infanticide or aggressive behavior of resident males towards immature individuals which includes those not sired by the resident males. Inbreeding avoidance is most probably not the reason why females copulate with extra-unit males although the researchers lack data to posit that females gain access to resources if they copulate with extra-unit males. 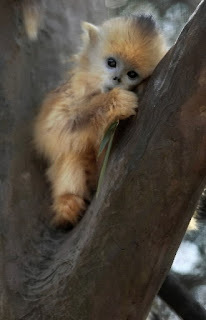 Finally, a gratuitous photo of a baby Golden snub-nosed monkey to start your day with an “Awwwww”. Photo from Yorkblog. I wonder if this mating behavior is specific to the focal population of R. r. qinlingensis, all R. r. qinlingensis or all Golden snub-nosed monkeys in general (R. roxellana). If the evolution of this mating behavior is purely to avoid infanticide and is adaptive, then we can posit that the female choice is merely to increase the fitness of her offspring. Gron, K. 2007. Rhinopithecus roxellana. Primate Factsheets. 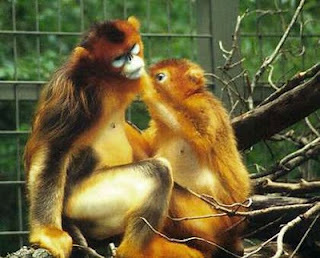 Retrieved March 17, 2010, from http://pin.primate.wisc.edu/factsheets/entry/golden_snub-nosed_monkey. Gron, K. 2008. Theropithecus gelada. Primate Factsheets. Retrieved March 17, 2010, from http://pin.primate.wisc.edu/factsheets/entry/gelada_baboon. Guo, S. Ji, W. Li, M. Chang, H. Li, B. 2010. The Mating System of the Sichuan Snub-Nosed Monkey (Rhinopithecus roxellana). American Journal of Primatology Retrieved March 17, 2010 http://www3.interscience.wiley.com/cgi-bin/fulltext/122602856/PDFSTART DOI:10.1002/ajp.20747. How interesting! And such beautiful pictures! I love the proboscis! Back in Malaysia they are call “Monyet Belanda” or “Dutch Monkey” because they think the proboscis nose and red face looks like the Dutch men (there were Dutch colonies in Malaysia, via Dutch East India Company). Thanks for the post. I’m going to track down that reference. I am interested in the extra-group mating stuff…I found similar results in the sifaka population that I study. If you don’t have access to the paper, email me. I’ll send you a copy. Prancingpapio at gmail dot com. Would love to see the results of your sifaka study … did you already published the paper? im interested in the pdf “The Mating System of the Sichuan Snub-Nosed Monkey (Rhinopithecus roxellana)” Can you send it to me by e-mail?